With school starting in the coming weeks, it’s inevitable that fall is right around the corner. I am all for pumpkin-everything, but Kristen and Rick’s wedding has me hanging onto sweet summer days for just a bit longer. With the help of A Fox Event, Kristen and Rick planned an intimate summer soirée at the Legare Waring House that allowed them to spend a bit of extra time with each guest (and stretch their budget a bit further!). With personal details weaved throughout, like Japanese Aralia leaves from her mother’s garden, and fun pineapple decor sprinkled into their classic design, I can see why Kristin’s joyful smile went from ear-to-ear! 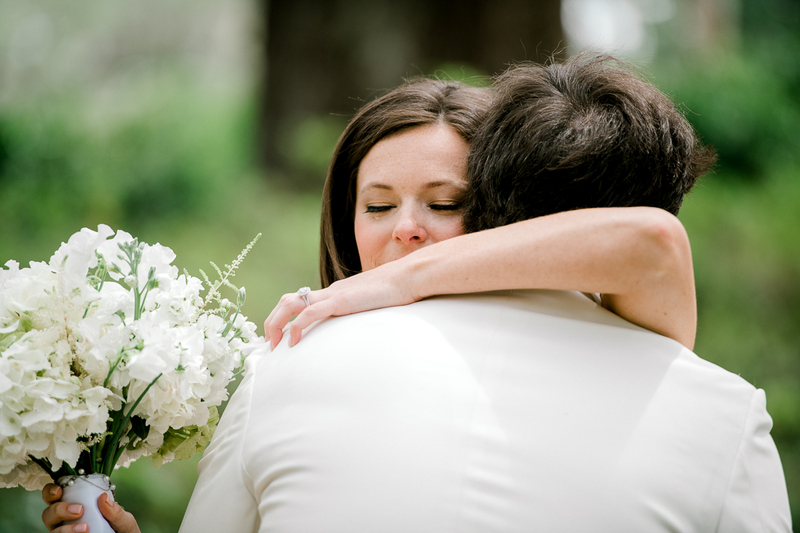 Big SW hugs to Jennings King for capturing Kristin and Rick’s wedding day! Tell us about finding your wedding dress. I knew I wanted a full skirt and I sure did not compromise! I expected to choose a very simple, classic style, but instead, I fell in love with the rich lace bodice on my dress as soon as I tried it on. It was a very special moment that I was lucky enough to share with my mom, sisters, mother-in-law, and cousins. I wanted a wild-looking, white, summery bouquet full of variety and greenery. Fox Events made me a gorgeous bouquet of peonies, astilbe, tulips, and a variety of garden roses, plus peach Juliet garden roses for a small pop of color. The greens included seeded eucalyptus, Italian ruscus, and smilax, and we added a Japanese Aralia leaf from my mom’s garden! Did you decide to do a first look? Why or why not? I felt very strongly about Rick seeing me for the first time as I made my way down the aisle, and he felt the same way, so we opted to keep it traditional. Because we had plenty of evening sunlight to work with in June, we did not have to worry about having our photos done before the ceremony. I absolutely loved seeing him tear up! What Southern details or traditions did you include in your celebration? What was Southern about your wedding? I strove to contract all local businesses and tried to find vendors who used local products. For example, Salthouse Catering’s menu was farm-to-table and seasonal, and ICEBOX offered local beer and liquor companies such as Palmetto Brewery and Striped Pig. The groom and groomsmen’s bowties were handmade in Mount Pleasant, and the maids gifts came from Spartina 449 of Daufuskie Island. Also Southern was our married monogram featured in different places, such as above the porch door, on the cocktail napkins, and on our champagne flutes (I also wore my maiden monogram as I got ready for the day). We had a classic coconut cake which is “very Charleston” and so delicious. The night before the wedding, we cut Japanese Aralia leaves from my mom’s garden. We used one in my bouquet and put one on each place setting. It was a really simple way to make my bouquet and the tablescapes more dramatic and personally significant (I carried a bit of my mom down the aisle with me!). And of course, the symbol of hospitality–the pineapple–was placed throughout the venue decor. What was one way you saved money or cut costs at your wedding? We married on a Friday evening and saved an enormous amount! I also had my envelopes hand-lettered by Whitlock Design (on Etsy) instead of calligraphed, and I ordered my veil through Etsy. I also replaced some florals with lanterns (and pineapples, of course!). Lastly, instead of renting a dance floor, we arranged the tables so that there was enough space to dance on the venue’s existing patio. By far, our favorite detail of the wedding was the beautiful cafe lighting over our reception. The weather worked in our favor and we were lucky enough to forgo a tent, which allowed for the historic home at our venue to serve as a gorgeous backdrop. The openness of the patio space complete with the cafe lighting gave the reception a very romantic, summery feel. My favorite personal detail of the wedding was incorporating my beloved grandmothers, who have both passed away, into the ceremony. I wore pink wedding shoes in honor of my mom’s mom, and my paternal grandmother’s chaplain married us. I also tied both late grandmothers’ wedding rings to my bouquet, and my sisters wore them the rest of the night following the ceremony. How did y’all meet? Tell us your love story. We first met at Stratton Mountain in Vermont as teenagers. Rick was competing in a snowboarding event and I was there with a close friend of mine. Rick and I realized that we hit the slopes at the same home mountain, and over the next few years, we unexpectedly ran into each other time after time. In the spring of my senior year of high school, we reconnected when Rick suggested we meet for coffee. We began dating shortly after I began my freshman year of college, and despite several intervals of living a great distance from each other, we’ve been together ever since! Tell us all about the proposal! Rick had my ring hidden under our bed for almost six months prior to proposing. There were many nights when it almost came out early, but he had made arrangements to fly us home to celebrate with friends and family just a few days after the proposal, so he held off. Rick had made a reservation at a historic brunch spot nestled in a canyon of the Santa Monica Mountains (we currently live in California). After a beautiful drive up oceanside cliffs, we entered the tranquility of the inner canyon, golden with the season of fall. Under a giant California oak, Rick went down on one knee. We reveled in our brunch, knowing the exciting secret we were keeping from those around us. 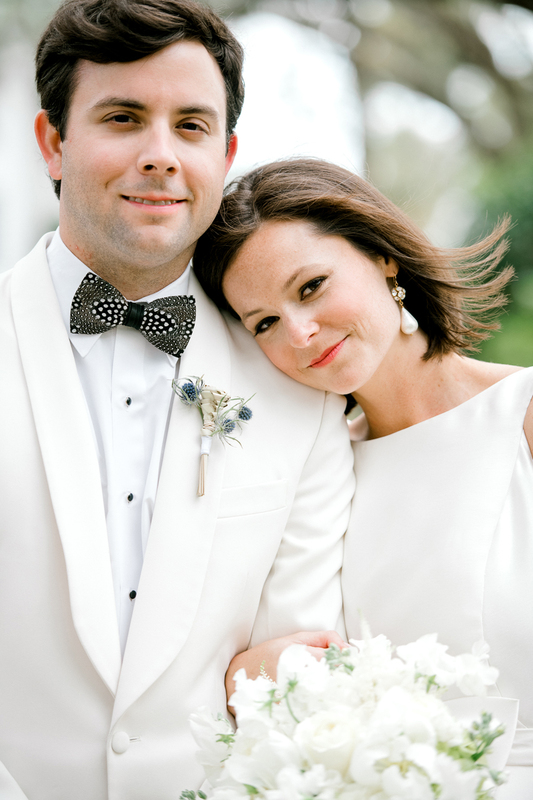 A few days later, we flew to Charleston to celebrate with family and friends. What readings, if any, did you have at your ceremony? My cousin recited Romans 12:9-16. It will always remind us to grow our love sincerely by putting each other first, and ourselves second. Tell us about some of the songs you used throughout your wedding and why you chose them. Rick and I had a classical guitarist play traditional music for the ceremony; I walked down the aisle with my dad to “Jesu, Joy of Man’s Desiring.” Our first dance was to “Forever and Ever, Amen” by Randy Travis. We are big classic country fans and just love this song! Rick and I traveled to Austin last year and learned to two-step, which was super fun. I love to slow dance, so I chose “Tennessee Whiskey” by Chris Stapleton for our last dance. It was so romantic and one of my very favorite memories of the night. How did you plan for your marriage while planning your wedding? We discussed in detail how and when to merge our finances and invest in our future together. We spent a lot of time setting financial and personal goals as a couple. What advice do you have for folks currently planning a wedding? You may feel rushed in the beginning of planning to secure your vendors, but I think it is really important to consider your desired guest count first. 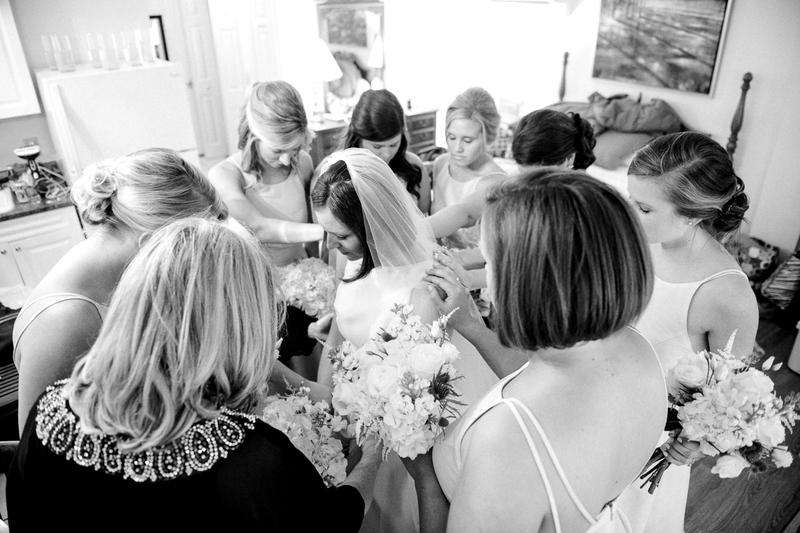 Holding a more intimate wedding allowed us to have more time with each guest, which was priceless. It also allowed our budget to go further and include extra personal details and a few splurges. What’s next for you as a couple? What memories are you looking forward to making together? Rick and I are finally enjoying post-wedding and post-graduate school tranquility! We are working hard to save for a home and relocate back to the South. We look forward to spending time with each other and our families, and perhaps starting a family of our own down the road. Is there anything else you’d like to share about your wedding? It was important to us that guests treated our ceremony as a worship, despite it being outside of a church. We also wanted to see guests’ faces instead of cameras and phones as we walked up the aisle for the first time as newlyweds. We were inspired by Southern Weddings’ “Unplugged Wedding” post and wrote our own notecards, which we affixed to the back of every seat. It was a huge success! Oh y’all, you know a Real Wedding is going to be gorgeous when you’ve already swooned (multiple times) and you’ve only seen the first three photos! It’s even better when you’ve also cried while reading the bride’s interview! Be sure to check out Mary Simm’s most memorable moment below — I know you’ll love it, too! 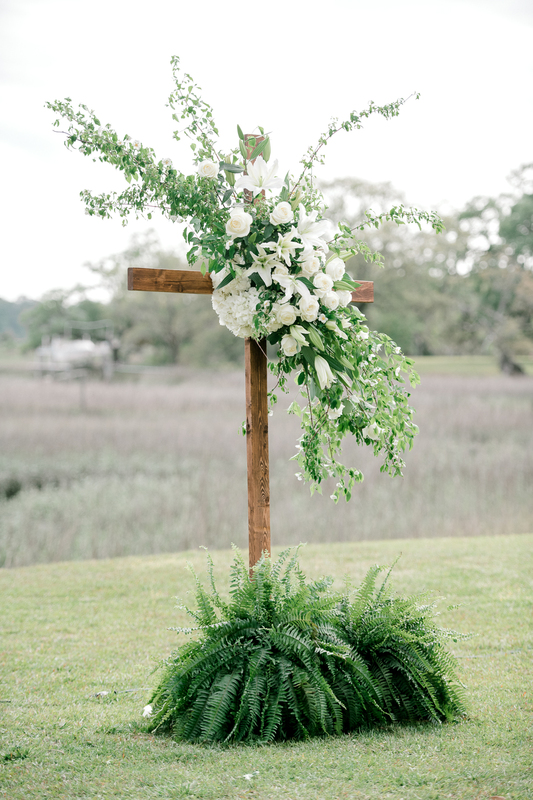 Mary Simms + Alex’s sweet South Carolina wedding was filled with family traditions, like the prayer her grandfather said before every meal, and handmade details like the amazing cross Alex made for their ceremony. 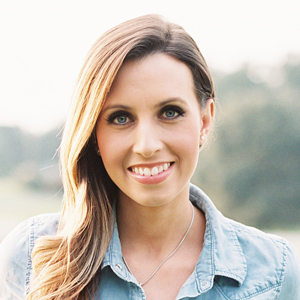 When asked what was Southern about her wedding, she replied, “What wasn’t Southern about it! ?” A girl after my own heart! We SW gals are sending Jennings King some big ol’ hugs for sharing this lovely day with us! Well hello, you beautiful sparklers! Mary Simms is giving the Duchess of Cambridge a run for her money! Keep an eye on that monogrammed beauty there — it will make its debut later in the evening! I found my dress at the first place I tried gowns on. However, I wasn’t quite ready to commit… finding THE one is a big deal, plus trying on all these beautiful dresses was beyond fun! My mother and I went to four other stores and I tried on probably 25 other dresses before returning to the first place. A month before the wedding during my bachelorette party, my bridesmaids and I went out to the wedding site at Boone Hall and buried a bottle of bourbon under a tree. (This is an old Southern tradition that if done correctly (the bottle must be buried completely full and upside down) means it will not rain on your wedding day.) Not a drop of rain on March 29th, so it’s safe to say I am a believer! 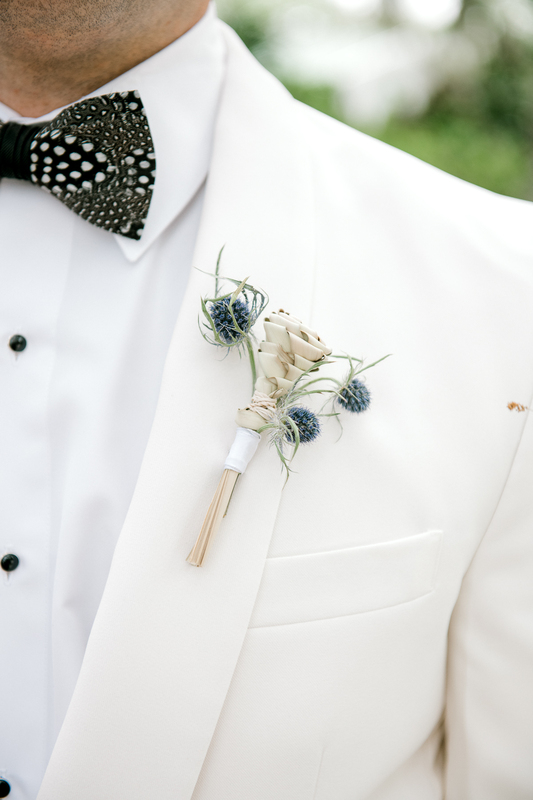 Our favorite detail of the wedding was: Honestly, everything. Every little detail was made with love. One detail that we really enjoyed was our getaway car. It was a 1952 light green Ford pick up truck appropriately named Sweet Pea and it was used for so many things throughout the night. It was set up next to the Cotton Dock with the tailgate down. We had burlap-wrapped buckets with water bottles and cans of champagne in them for our guests. After the ceremony, Sweet Pea became the backdrop for our photo booth. It certainly made for some GREAT pictures! At the end, Alex and I sat on the back of the truck while a driver drove us off into the night. For our wedding favors, Alex and I made 200 cotton angels that we tied strings to so they can be used for ornaments. We love to travel, and we always bring home a Christmas ornament from every place we go, so we thought the cotton angels would be a personal touch for all of our guests to keep. Alex picked the cotton himself from a family cotton field and we spent many nights gluing on halos and wings. We didn’t do a first look either. Alex didn’t know anything about my dress or how I would wear my hair, and he wanted it to be that way until the moment he saw me walking down the aisle. As much as we wanted to see each other before, we knew the surprise factor would make it much more exciting for us. The second I saw him standing in front of me at the end of the aisle was the best second of my life. It was such an amazing and overwhelming feeling and I will never ever forget it. What advice do you have for folks currently planning a wedding? Enjoy every minute because it all happens in the blink of an eye. Soak it all in and remember that at the end of the day it’s about the two of you. After your ceremony, have a friend or family member make you a plate of food and eat it! You will be so busy talking to everyone and dancing that it is easy to forget to eat. Also, a piece of advice that my photographer Jennings gave me a few days before the wedding: Try to take a moment or two away from everyone during the reception, just the two of you. Say I love you, take a few deep breaths, and enjoy your first moments as a married couple. Describe your wedding cake or dessert. We had a round, three-tier cake with a bead border around each tier. Each tier was a different flavor: the bottom tier was white chocolate, the middle tier was hummingbird with a cream cheese filling (my absolute favorite!) and the top tier was chocolate Kahlua (which we have in our freezer!). I love that Mary Simms changed from a white sash at the ceremony to this fabulous monogramed Tiffany blue sash at the reception! How did y’all meet? Tell us your love story. The night after a mutual friend pointed out we had a lot in common and should go out Alex asked me to go to dinner with him on Folly Beach. I ordered the tuna and asked for it to be cooked rare, and from that moment on Alex says he knew he was going to marry me one day. We in fact did have a lot in common (including our love for a good piece of seafood) and have had many dates since then! Tell us all about the proposal! A few of our close friends had already booked a Mediterranean cruise and had been begging us to join them for months. Although Alex and I had just got a new puppy a week before, we decided that we just could not pass up this offer. We booked our spot on the cruise along with our plane tickets the very next day. Getting ready for the long journey across seas, I was nervous and excited all at once: not only was this my first time going to Europe, but we were also going to be there for my 25th birthday! Our itinerary said we would be in Rome for two days, the first of which would be on my birthday. On July 18th, Alex and I and our friends decided that we would tour the city of Rome, beginning with a tour of the Vatican. There is a strict dress code for the Vatican, where men have to wear long pants and women should not have their shoulders or knees showing. Needless to say, it got a little hot walking around the city in 80 degrees after the tour of the Vatican was over. We all decided to walk over to the famous Trevi Fountain to toss in our good luck coins before breaking for lunch. During the walk over, I noticed Alex wasn’t talking very much and seemed like he was trying to catch his breath. He assured me nothing was wrong, that he was just hot and would be fine soon. We made our way through the crowd, down the steps and to the bottom of the Trevi Fountain where my best friend Gina told Alex and I to face her as we tossed our coins in so she could get a picture. It was then, as I was grinning from ear to ear, tossing my coin over my shoulder at the same time Alex was, that Gina screamed, “Oh my Lord! Mary Simms! !” I had no idea what she was shouting for until I turned my head to look at Alex, who was down on one knee proposing. It was hands down the best moment of my life. I was in a beautiful city known for its romance, surrounded by my closest friends, and the man of my dreams asking me to spend the rest of my life with him. I said yes, and the entire crowd began clapping. It was magical, to say the least. Tell us about some of the songs you used throughout your wedding and why you chose them. A trio including a flutist, a trumpet player and a violinist played music before the ceremony started. We used “Jesu, Joy of Man’s Desiring” for the seating of the mothers, “Trumpet Voluntary” for the processional, Wagner’s “Bridal Chorus” for my processional, and Mendelssohn’s “Wedding March” for our recessional. Our first dance was “Have I Told You Lately That I Love You” by Van Morrison and our father/daughter dance was to “I’ll be there” by Jackson 5. Describe your wedding flowers. Our flowers were absolutely beautiful: pink peonies, white roses, cherry blossoms, and white hydrangeas in large and small vases. Since our wedding was two days before Easter, we wanted our decor to be soft, but elegant. What Southern details or traditions did you include in your celebration? What was Southern about your wedding? What wasn’t Southern about it!? 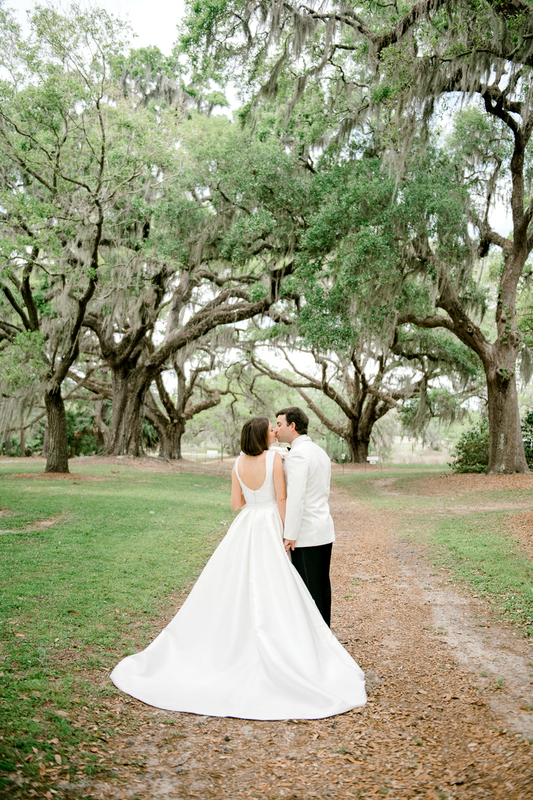 We were married on an old dock on a historic, breathtaking Southern plantation surrounded by live oaks with hanging moss, cotton fields, oyster beds, and salt water. We also had a family prayer that was said before the food was served: “Lord, Bless us and Bind us, Put our Sins Behind us, and Hide us where the Devil can’t Find us!” My grandfather would say this before every meal, and it has been passed on to every family member. Alex built the cross we used as our backdrop on the dock. It was the most beautiful thing I have ever seen. My aunt hand-sewed my new initials into the handkerchief that I used to wrap around my bouquet. We had a direction sign of our favorite places that we have traveled to over the years. The special thing about the sign was that each of my bridesmaids painted an arrow. What was your most memorable moment about your wedding day? 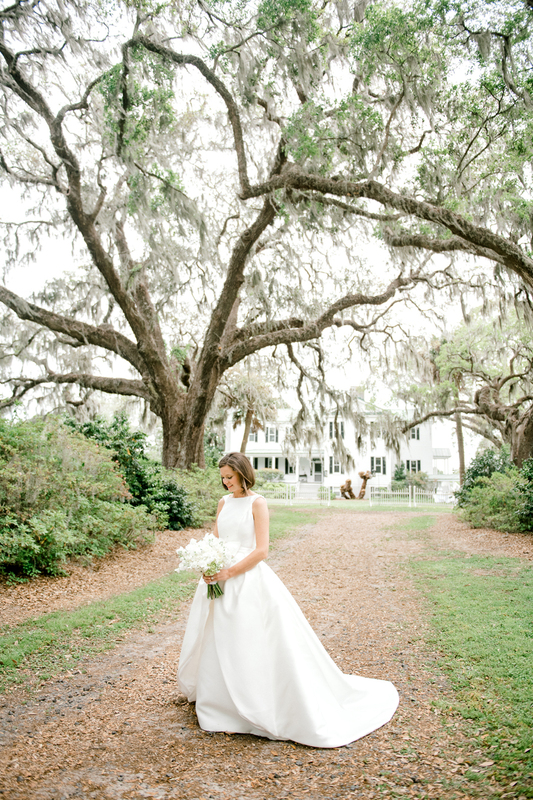 It was all very memorable, but the one moment that I will cherish for a lifetime was when I arrived at Boone Hall in the car with my maid of honor. We were waiting for the go ahead from my wedding planner that we could get out of the car when I saw one of Alex’s groomsmen running down the road toward us. I had no idea what was happening, or why on earth he was not with Alex and the other groomsmen. The ceremony was supposed to start in less than five minutes! He motioned for me to roll down my window, and when I did, he handed me a folded up piece of paper and said, “This is from Alex. He says he loves you to the moon and back times a million and he can’t wait to see you.” (Alex and I say that to each other all the time). The tears were already starting to roll, and I contemplated for about a second whether I should read the letter or not, because I didn’t want to be a complete mess walking down the aisle. But I pulled my self together and read aloud the sweetest letter I have ever received. All of my wedding jitters were suddenly gone, and I couldn’t wait to get out of that car! What’s next for you as a couple? What are you looking forward to in the future? Alex and I are most excited to start building a life and a family together. We closed on our first house two weeks after the wedding, and are now getting all settled in. We have plans to travel as much as we can and continue to enjoy every day that God gives us. Ooh! Events is a delightful member of our Blue Ribbon Vendor Directory! 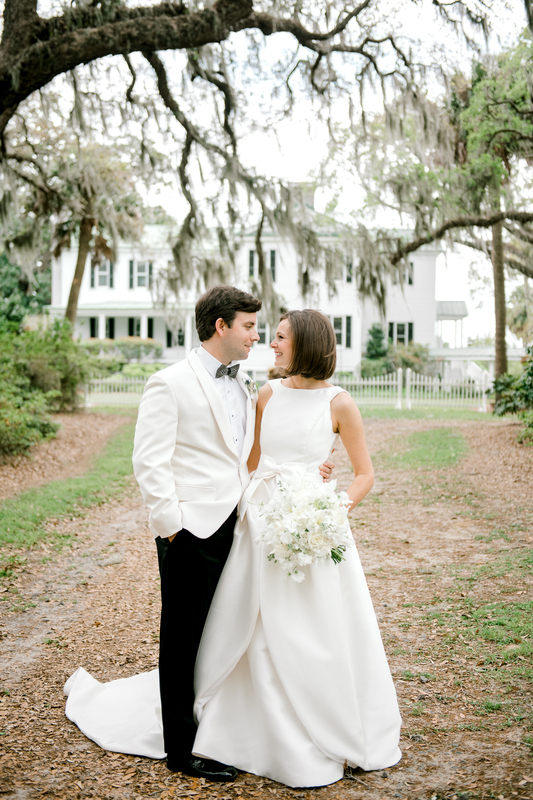 The only thing sweeter than this beautiful Southern wedding is the story behind it! I love their proposal story and her most memorable moment of the day! Absolutely our pleasure! You did an amazing job! What a well-deserved honor for Jenning the photographer who caputered it all, Julia the MOB who planned it all, and Mary Simms…the beautiful bride who glowed through it all! 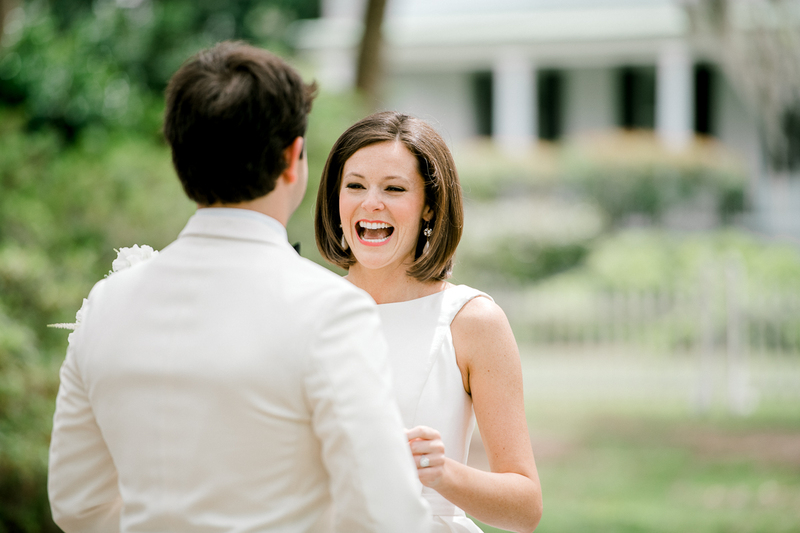 What a special wedding and I am so happy it is being shared with so many through Southern Weddings! These pictures and ideas are fantastic! Do you know where they bought their custom koozies from? Loved all the ideas. 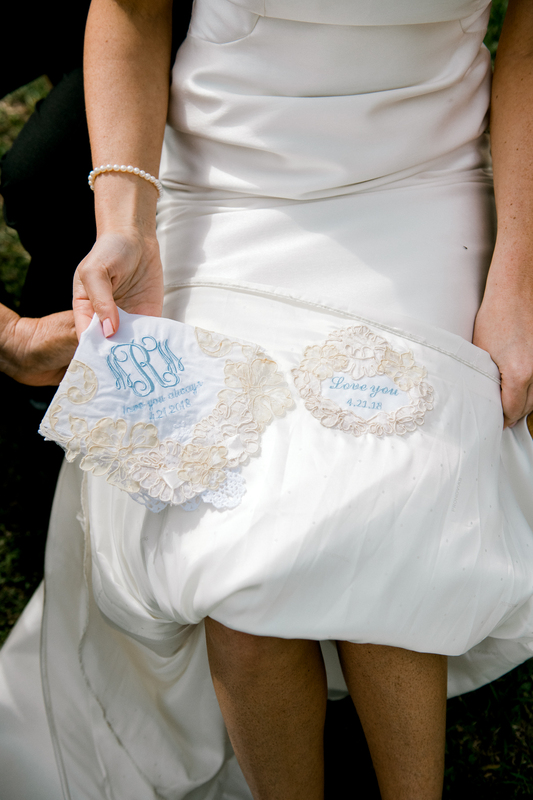 Oh I love her garter… do you know where it’s from??? Who made your dress?? It is absolutely GORGEOUS!